Back in 2013, the sky was the limit for Tesla, and Elon Musk was promising a low-cost 90-second battery swap at charging stations in the future. Since then, reality has set in, and those plans seem to be on hold. What’s the next best solution for those long charging times? Maybe put your feet up and microwave a burrito. At the moment, these stations have a strange, unfinished quality. Tesla owners pull up to a slim charging station, connect the charger, and settle in for what Tesla claims is about 30 minutes to get half-way charged. The idea is that you should be charging the car’s battery at home overnight and the supercharger shouldn’t be needed as regularly as a standard filling station. But if Tesla really wants to kill the old gas-powered car, it’s going to need to expand its infrastructure and make it convenient enough to drive from the top of Canada to the tip of Argentina. Somewhere along the way, you’ll need to pee. According to Restaurant Business, Straubel showed off slides of a charging station “that looked exactly like a c-store,”—industry jargon for a convenience store. But what would a Tesla convenience store be like? Would it be higher-end? Could you get a massage? Will there be Slurpees? It seems like these questions are only in the nascent stage of being answered. Straubel referred to the stations acting as “convenience stops” which could imply something closer to a highway rest stop. He also said that the company “already [has] been working with restaurants,” so maybe it’ll offer full-fledged dining. He did say that Tesla is uninterested in managing a food service, so maybe the company will just bring in 7-Eleven and avoid becoming the Bodega of the suburbs. However Tesla works this out, it’s interesting to remember the enormity of the company’s ambitions. A lot of focus gets put on the tech and price of the battery-powered cars, but manufacturing and infrastructure are huge parts of the business. The “Gigafactory” plant in Nevada is designed to produce more batteries than the entire industry currently pumps out. 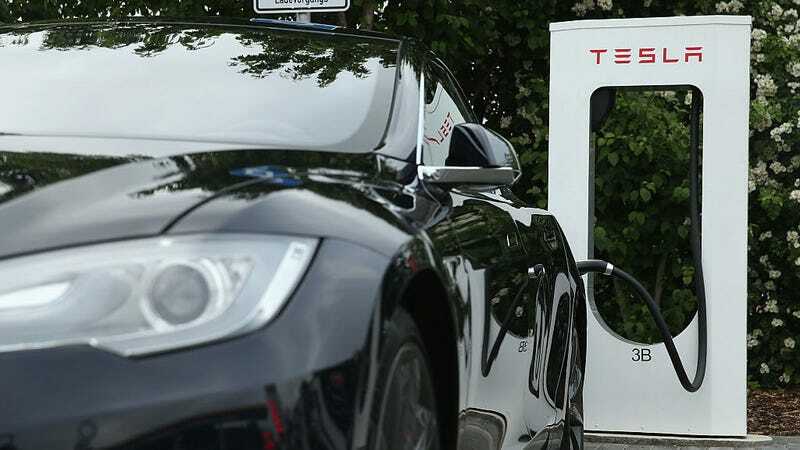 With the superchargers, Tesla is attempting to replace filling stations. But those stations are mostly owned by the oil industry. In Tesla’s case, it has an opportunity to control the car manufacturing, fuel delivery, and the sugary treats you pick up while you recharge. It seems wise for Tesla execs not to throw themselves into the complicated supply chain of the food industry, but it still has the option. One exciting prospect is the idea of teens once again hanging out at the convenience store like the slackers in SubUrbia. Hell, everyone will be hanging out—they’ve all got a lot of time to kill.